But this year I have been lucky enough to team up with The Iconic, as they have just launched a new SNAP TO SHOP feature on their app! So you can screen shot my looks and recreate your own fashion week street style look! Search the app on your phone or click here for more. 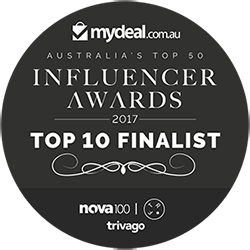 The Iconic is the best platform to shop online from in Australia due to their huge collection of brands and world-class delivery and return policies, so if you live down under and haven’t used it – get online and have a click around now! There are options to get things delivered within 3 hours or next day delivery for a small fees. You get free returns and this makes it so easy for me when I’m just back in town for short stays. And with this special new function, you are now able to shop my looks more easily. Just incase you didn’t know, The Iconic now has a premium section and you are able to buy items from Sandro, Aje, Michael Lo Sordo all from one store! Aw thank you babe!! It is lovely to be home!! Aw glad you like them babe!! Had a great time thank you!! This is such a fabulous look dear! I love the blue blazer, such a chic and cute color, and looks amazing with the skirt. Also, you can’t go wrong with the elegance of the 2nd outfit too. Aw thank you lovely, glad you liked the looks!! You’re rocking that blazer!! Love the look with a pop of red. welcome back. You had the cutest looks last week! Loved them! Aw thanks babe!! Glad you loved the looks!! Great look Ash! 😀 The Iconic is always the first place I go to when online shopping cos of their superfast delivery. Hope you enjoyed Sydney! Are you missing it?